EISENHOWER, Dwight “Ike” (1890 –1969) was an American army general and statesman who served as the 34th President of the United States from 1953 to 1961. During World War II, he was a five-star general in the United States Army and served as Supreme Commander of the Allied Expeditionary Forces in Europe. He was responsible for planning and supervising the invasion of North Africa in Operation Torch in 1942–43 and the successful invasion of France and Germany in 1944–45 from the Western Front. He was also the first President to be bound by the 22nd Amendment, which limits the number of times one can be elected to the office of President of the United States. 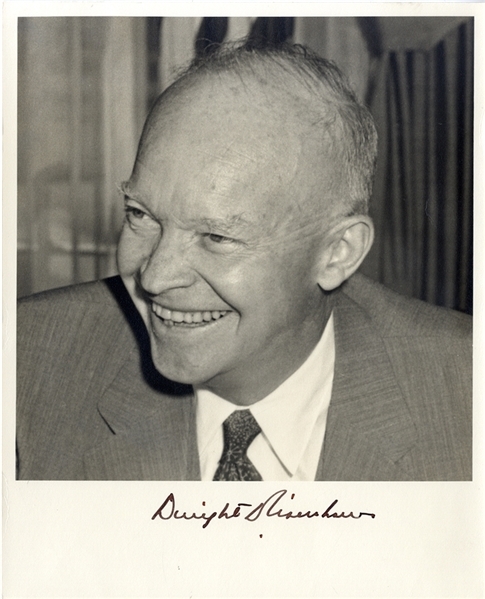 Photograph Signed “Dwight D. Eisenhower” 8”x10” black and white, signed boldly in margin. Fine condition. Auction closed on Thursday, June 21, 2018.